As it was pointed out to me recently, I’m suffering from a so-called “First World Problem:” I’m running out of female comedians with audiobooks to listen to! 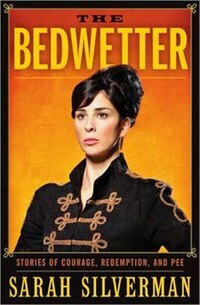 After Tina Fey, Mindy Kaling, and Chelsea Handler, I gave Sarah Silverman a shot with her 2010 memoir The Bedwetter: Stories of Courage, Redemption, and Pee. I knew that Silverman was a vulgar comic from watching her roasts and viral videos like “I’m F***ing Matt Damon,” but I knew nothing about her personal journey. So it was interesting to learn that she suffered from chronic depression, anxiety, and bedwetting until she was 16 years old. Because of her mental illnesses, she has even chosen to not pass down her genes and reproduce. The book definitely gave me a newfound respect for Silverman. I empathized with her stories of childhood bullying, and shared in her success in capitalizing on feeling like an outsider. Let’s just say I hope that there are loads of people kicking themselves for mistreating this dark-haired Jewish girl turned celebrity! Is The Bedwetter on the same level as Bossypants? Not by a long shot, but it is funny. The main downside I had with the book was its structure. The first half was fine, with linear chapters chronicling life from before she was born to her dropping out after one year in college to focus on stand-up. However, after her ‘mid-word,’ it’s apparent that editing got a bit lax. The chapters jumped around from her various PR scandals over her many controversial jokes to her thoughts on her Jewish identity. She wrapped it up well in the afterword (written tongue-in-cheek from the perspective of God after Silverman’s future death), but I just wish that the second half had a better flow. And like Chelsea Handler, Sarah Silverman is an acquired taste. Not everyone will enjoy her profanity and crudeness, but I hope that people can recognize the importance of free speech in comedy. You may not like her graphic descriptions of female sexuality, but I’m glad that she fights for equal opportunity vulgarity. Female comedians are constantly criticized for not acting ‘ladylike,’ and I applaud Silverman for refusing to silence her voice and follow traditional gender roles. If you’ve got other audiobook suggestions, let me know! This entry was posted in Audiobook Review and tagged audiobook, book review, comedy, humor, memoir, Sarah Silverman, The Bedwetter by Book Club Babe. Bookmark the permalink.